Last week was marked by more volatility in equities, with financial markets processing both technology news and trade actions. With that said, the Federal Reserve noted continued strength in the underlying economy, particularly in labor markets, in the statement accompanying its March 20–21 Federal Open Market Committee (FOMC) meeting. According to the latest economic projections, participants expect faster growth moving forward, especially after passage of tax reform and continued signs of strength in the global economy. In December, the Federal Reserve forecasted 2.5, 2.1 and 2.0 percent growth for 2018, 2019 and 2020, respectively. That outlook for real GDP growth has risen to 2.7, 2.4 and 2.0 percent in the latest survey. The FOMC also anticipates that the unemployment rate will fall to 3.8 percent in 2018 and 3.6 percent in 2019. The December projections called for 3.9 percent in both years. As expected, the FOMC ended its March 20–21 meeting by hiking short-term rates by 25 basis points. This was the first FOMC meeting Jay Powell chaired, and the Federal Reserve is likely to increase the federal funds rate at least two (and maybe three) more times in 2018. Participants’ economic projections were consistent with two more rate hikes this year, with the midpoint of the federal funds rate rising from 1.625 percent now to 2.1 percent by the end of the year. It is worth noting that the Federal Reserve’s current outlook for the next two years is more aggressive than it was in December. Respondents now see the federal funds rate increasing to 2.9 percent and 3.4 percent by year’s end in 2019 and 2020, respectively, up from 2.7 percent and 3.1 percent three months ago. As always, the actual pace of rate hikes will hinge on incoming data. Data on manufacturing activity also continued to be encouraging. The IHS Markit Flash U.S. Manufacturing PMI rose to 55.7 in March, the best reading in three years. One of the key drivers of that higher headline number was employment, with hiring continuing to expand strongly amid tightness in the overall labor market. In addition, manufacturers felt very optimistic about future output, with that index rising to the highest point since February 2015. On the downside, raw material prices picked up in the latest survey, with costs expanding at rates not seen since September 2011. In a similar way, manufacturers in the Kansas City Federal Reserve Bank’s district also noted strong expansions in its March survey, with the employment index rising to a new all-time high in the survey’s 17-year history. The average workweek also widened to the best reading in seven years. This mirrored other regional sentiment surveys, which have found mostly optimistic assessments about both current and future growth, but with accelerating input costs. Moreover, new durable goods orders rebounded, up 3.1 percent in February after falling 3.5 percent in January. Much of that volatility stemmed from shifts in aircraft and parts sales, which can have large swings from month to month. Stronger motor vehicles and parts orders (up 1.6 percent) also buoyed the increase in February, and with solid gains in aircraft and automobiles, transportation equipment orders jumped 7.1 percent for the month. New durable goods orders have trended strongly higher across the past 12 months, soaring 6.9 percent since February 2017. One of the more important measures in this release is new orders for core capital goods (or nondefense capital goods excluding aircraft), which can often be seen as a proxy for capital spending in the U.S. economy. In February, new orders for core capital goods increased 1.8 percent, but like the headline number above, the year-over-year pace was a very healthy 8.0 percent. Consumer spending has been a bright spot in the economy, and preliminary data from the University of Michigan’s confidence measure jumped to the highest level since January 2004. However, retail sales were weaker than desired in January, starting the new year off on a disappointing note. With that in mind, upcoming reports this week on personal income and spending data will be watched closely for signs that Americans are once again opening their pocketbooks. Even with some easing in January, personal spending has risen by a healthy 4.5 percent year-over-year. Other highlights this week include updates on manufacturing surveys from the Dallas and Richmond Federal Reserve Banks and data for consumer sentiment, the second revision for real GDP growth, international trade in goods and the Chicago Federal Reserve’s National Activity Index. The Conference Board’s Leading Economic Index (LEI) rose 0.6 percent in February after jumping 1.0 percent in January. Overall, this report continued to reflect a U.S. economic outlook that is trending in the right direction, with the LEI up by a very healthy 4.0 percent over the past six months. This bodes well for solid economic growth moving forward. New orders for manufactured goods were among the bright spots in the latest data, providing one-third of the increase in the headline figure in February. The average workweek of production workers, consumer confidence, the interest rate spread, overall lending conditions and unemployment claims also made notable positive contributions to the LEI in the latest data, but building permits and the stock market were drags. Meanwhile, the Coincident Economic Index (CEI), which assesses current conditions, rose 0.3 percent in February, the best reading since November. Each component of the CEI—industrial production, nonfarm payrolls, personal income and manufacturing and trade sales—contributed positively to the index for the month. Manufacturing production jumped 1.2 percent in February, rebounding from a decline of 0.2 percent in January, with 2.5 percent growth over the past 12 months. That was the fastest year-over-year pace of growth for the sector since July 2014. The Census Bureau reported that new durable goods orders rebounded, up 3.1 percent in February after falling 3.5 percent in January. Much of that volatility stemmed from shifts in aircraft and parts sales, which can have large swings from month to month. Stronger motor vehicles and parts orders (up 1.6 percent) also buoyed the increase in February, and with solid gains in aircraft and automobiles, transportation equipment orders jumped 7.1 percent for the month. Excluding transportation equipment, new durable goods orders increased 1.2 percent in February. New durable goods orders have trended strongly higher across the past 12 months, soaring 6.9 percent since February 2017. One of the more important measures in this release is new orders for core capital goods (or nondefense capital goods excluding aircraft), which can often be seen as a proxy for capital spending in the U.S. economy. In February, new orders for core capital goods increased 1.8 percent, but like the headline number above, the year-over-year pace was a very healthy 8.0 percent. Looking more closely at the various durable goods sectors in February, the data mostly rose. In addition to transportation equipment, sales also increased for primary metals (up 2.7 percent), electrical equipment, appliances and components (up 2.6 percent), machinery (up 1.6 percent), other durable goods (up 0.9 percent) and fabricated metal products (up 0.8 percent). The lone major category with reduced orders for the month was computers and electronic products, which edged down 0.2 percent in February. Meanwhile, durable goods shipments increased 0.9 percent in February, or with transportation equipment excluded, shipments rose 1.0 percent. Much like the new orders data described above, shipments have trended convincingly higher over the past year. Since February 2017, durable goods shipments have risen at solid rates, up 6.8 percent, with year-over-year growth of 7.4 percent when excluding transportation equipment. In addition, shipments of core capital goods have also improved mightily over the past 12 months, up 9.0 percent year-over-year. The underlying data in February showed mixed results. Existing single-family home sales increased from 4.76 million units in January to 4.96 million units in February, but condominium and co-op sales slipped from 620,000 to 580,000. On a year-over-year basis, sales edged up 1.1 percent, boosted by a 1.8 percent increase for single-family units. Meanwhile, there were 3.4 months of supply for existing homes, the same pace as in the prior report. Inventories have trended generally lower, helping to raise list prices. The median existing home sales price was $241,700 in February, up 5.9 percent from one year ago. As expected, the Federal Open Market Committee (FOMC) ended its March 20–21 meeting by hiking short-term rates by 25 basis points. This was the first FOMC meeting Jay Powell chaired, and the Federal Reserve is likely to increase the federal funds rate at least two (and maybe three) more times in 2018. Participants’ economic projections were consistent with two more rate hikes this year, with the midpoint of the federal funds rate rising from 1.625 percent now to 2.1 percent by the end of the year. It is worth noting that the Federal Reserve’s current outlook for the next two years is more aggressive than it was in December. 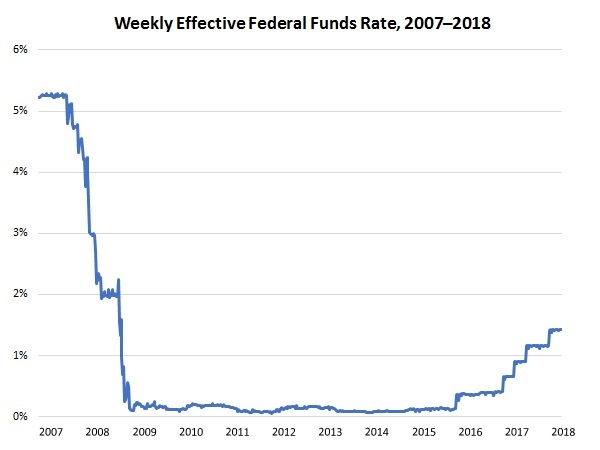 Respondents now see the federal funds rate increasing to 2.9 percent and 3.4 percent by year’s end in 2019 and 2020, respectively, up from 2.7 percent and 3.1 percent three months ago. As always, the actual pace of rate hikes will hinge on incoming data. The acceleration of rate hikes likely stems from expectations of faster growth, especially after passage of tax reform and continued signs of strength in the global economy. In December, the Federal Reserve forecasted 2.5, 2.1 and 2.0 percent growth for 2018, 2019 and 2020, respectively. That outlook for real GDP growth has risen to 2.7, 2.4 and 2.0 percent in the latest survey. The FOMC also anticipates that the unemployment rate will fall to 3.8 percent in 2018 and 3.6 percent in 2019. The December projections called for 3.9 percent in both years. In its accompanying statement, the FOMC noted that “the labor market has continued to strengthen and that economic activity has been rising at a moderate rate,” and it highlighted healthy gains in hiring, even with some slight softening in consumer and business spending. In particular, the FOMC said, “The economic outlook has strengthened in recent months. The Committee expects that, with further gradual adjustments in the stance of monetary policy, economic activity will expand at a moderate pace in the medium term and labor market conditions will remain strong.” While inflationary pressures have picked up recently, they are not a concern at this time. The IHS Markit Flash U.S. Manufacturing PMI rose from 55.3 in February to 55.7 in March, the best reading in three years. One of the key drivers of that higher headline number was employment (up from 55.0 to 55.6), with hiring continuing to expand strongly amid tightness in the overall labor market. In addition, manufacturers felt very optimistic about future output (up from 69.5 to 74.1), with that index rising to the highest point since February 2015. Interestingly, most of the other measures of activity eased in March while remaining encouraging, including new orders (down from 57.0 to 56.3), output (down from 55.5 to 55.2) and exports (down from 51.9 to 51.0). On the downside, raw material prices picked up in the latest survey (up from 60.9 to 64.9), with costs expanding at rates not seen since September 2011. Meanwhile, manufacturing activity in Europe slowed to an eight-month low despite continuing to show signs of modest growth overall. The IHS Markit Flash Eurozone Manufacturing PMI declined for the third straight month from 58.6 in February to 56.6 in March. The underlying data reflected decelerating activity across the board, including for new orders (down from 58.0 to 55.4), output (down from 59.6 to 56.1), exports (down from 57.0 to 54.7) and employment (down from 57.4 to 56.4). Manufacturers in Europe remain mostly upbeat about production over the next six months, even with some easing in the index of future output (down from 67.1 to 64.9). Input costs also remained highly elevated despite being somewhat slower in March (down from 68.7 to 65.6). In addition to data on Europe as a whole, IHS Markit also released figures for France (down from 55.9 to 53.6) and Germany (down from 60.6 to 58.4), both of which slowed to multi-month lows on weaker—but still reassuring—demand and output growth. Final data on each of these surveys will be released April 2. The Kansas City Federal Reserve Bank reported that manufacturing activity continued to expand strongly in March, with the composite index of general business conditions unchanged at 17. Employment remained one of the bright spots in the latest survey (up from 23 to 26), with the index rising to a new all-time high in the survey’s 17-year history. This reflects an ever-tightening labor market, with the average workweek also widening to the best reading in seven years (up from 11 to 15). At the same time, production (down from 21 to 20) and shipments (down from 24 to 12) slowed a little in March, with new orders contracting for the first time since August 2016 (down from 16 to -1). Exports were also softer than desired (down from 2 to 1). On the downside, the index for prices paid for raw materials soared to the highest point since April 2011 (up from 50 to 55), mirroring other recent indicators showing accelerating input costs. Nearly 60 percent of manufacturing leaders responding to the survey said their raw material costs increased in March, with just 4 percent noting reductions and 37 percent suggesting no changes. This is a trend that is expected to continue moving forward, with the forward-looking index for input costs edging down from a seven-year high but continuing to be very highly elevated (down from 73 to 72). Accordingly, 74 percent of manufacturers in the Kansas City Federal Reserve district see raw material prices rising over the next six months, with 4 percent predicting declines for their firm. The Census Bureau and the Department of Housing and Urban Development reported that new home sales inched lower in February, down 0.6 percent, falling for the third straight month. New single-family residential sales declined from 622,000 units at the annual rate in January to 618,000 units in February. This data reached 711,000 units in November, the fastest pace since October 2007, but has been disappointing since then. In February, sales increased in the Northeast and South but fell in the Midwest and West. On a year-over-year basis, new single-family home sales rose marginally, up 0.5 percent from 615,000 units in February 2017, further illustrating the softness of the latest figures. It is hoped this pullback is short-lived with faster growth moving forward. With weaker sales growth in the latest data, inventories of new homes for sale widened for the month. The number of months of supply on the market has jumped from 4.9 months in January to 5.9 months in February, the highest level since July. Even with the additional supply, median sales prices have jumped 9.7 percent over the past 12 months, up from $298,000 one year ago to $326,800 in February. California created the most net new manufacturing jobs in February, according to the Bureau of Labor Statistics, adding 3,500 workers in the month. Ohio (up 2,900), Florida (up 2,800), Virginia (up 2,600) and Wisconsin (up 2,500) also topped the list of manufacturing employment gains in February. In addition, Illinois saw the greatest job gains in the sector over the past 12 months, with manufacturing employment in the state up 18,100 since February 2017. Other states with the fastest manufacturing job growth year-over-year included Texas (up 16,100), Ohio (up 12,000), Wisconsin (up 11,800), California (up 10,700) and Iowa (up 10,400). The national unemployment rate remained at 4.1 percent in February, staying at its lowest level since December 2000. Hawaii had the lowest unemployment rate in the country (2.1 percent), followed by New Hampshire (2.6 percent), North Dakota (2.6 percent), Nebraska (2.8 percent), Vermont (2.8 percent), Iowa (2.9 percent), Maine (2.9 percent) and Wisconsin (2.9 percent). In contrast, Alaska (7.3 percent), New Mexico (5.8 percent), the District of Columbia (5.7 percent) and West Virginia (5.4 percent) had the highest unemployment rates.